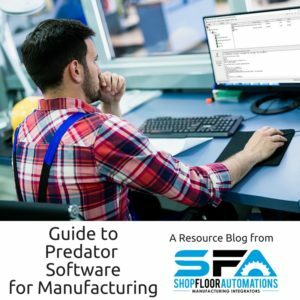 Predator is a line of software for those in manufacturing to help increase productivity on the shop floor. The Suite is often called Predator CNC Software by customers of this industry, but it is worth noting that it works on more than just CNC machines. Customers who want machine data collection, CNC revision control, want to drip feed machine programs, manage thousands of machine programs, organize their manufacturing processes through PDM, go paperless in their factory, manage tools. or achieve the goal of lean manufacturing turn to Predator. What do you need in order to run Predator? Who can use it? What does it work with? Scroll down for more info! USB Connect Pendant – This DNC transfer box helps to offer more machine program storage for your CNC machine through a Serial port connection via a USB stick of any size. There are also specific Mazatrol and Switchbox versions available. USB Connect Portable – This portable version of the USB Connect Pendant model can be carried around the shop, rather than mounted on and dedicated to one machine. It also helps the operator eliminate the four-hour long installation process. Floppy Drive Emulator – If you are still using floppy disks on the shop floor, this is the solution for you. While it will not increase storage in any way for your machine, it will replace obsolete media on your shop floor and expand the life of your legacy machinery. Shop Floor Automations is the #1 rated reseller of Predator Software since 1999. An MFG integrator is the best choice to go with before integrating the software suite into your manufacturing operation, as you get support and training opportunities versus going it alone. Give us a call at (877) 611-5825 or fill out a contact form. Want free G-code editing software? Check out CNC Editor Light from Shop Floor Automations. Free CNC editor for your hobby machinist needs. Also great for doing a trial run for larger machine shops.